Here at PJ Electrical, we are experienced and professional designers and installer of Grid Connect Solar Systems for residential homes and properties. We are a local Adelaide electrical company who only employs professionals. This is because we want not only the best products, but also services and skills when it comes to our customers. We service regions of Adelaide, Adelaide Hills and Fleurieu Peninsula. 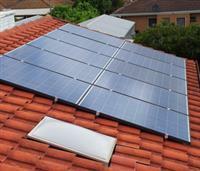 We also offer a free, on-site consultation when it comes to solar installation. We believe that it's important to see all our potential clients' houses, obtain some important measurements and answer any questions before any decisions can be made. Because we also spend a lot of time repairing solar systems installed by other companies - we know exactly, what a good system will look like. We give a 5 year warranty on the workmanship on all systems we install. Please use the Contact form on the right for Solar System Designer and Installers information and ordering. Your message will be sent to PJ Electrical Solar only. Privacy & Anti Spam protected.